Not too long ago, my friend Genna took me out for a fabulous dinner. How nice is that?! She is the best! I have avoided writing this post for the longest time, just because I knew that re-living this meal would make me want to go back… like soon. She took me on our girls night to Verdad, a Latin influenced tapas restaurant and Tequila bar in Bryn Mawr, a suburb of Philly. This place is awesome. The atmosphere of the restaurant is perfect for a night like ours, a date, or it even could be good for a large group of people. They have two floors, and the first floor has large tables, small tables, and even leopard-print booths. Love. Our server gets an A+ for the night too, as she was very helpful with our ordering, deciding, and very attentive throughout. We even saw her walk upstairs holding a martini glass with a flaming drink. Impressive. She recommended that we order 2-3 dishes per person. 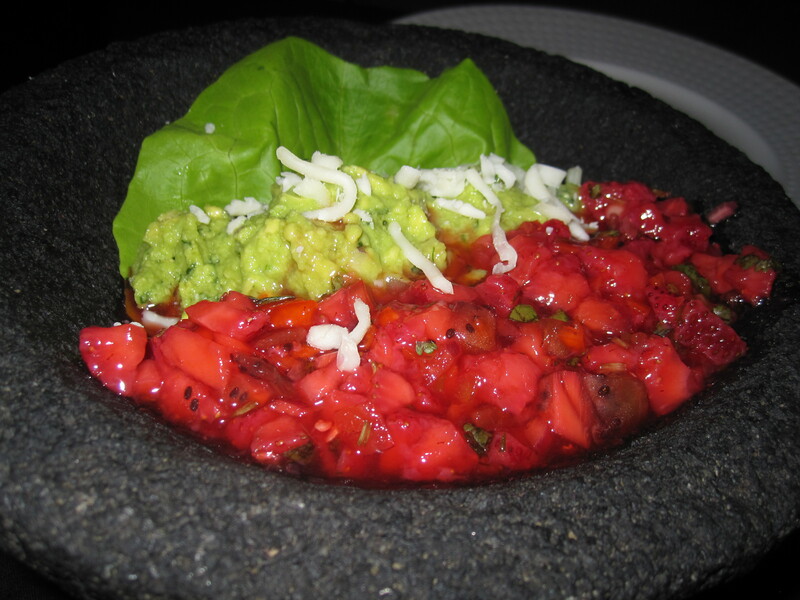 Genna and I both agreed that we should start with the Strawberry Habenero Guacamole. Like, okay… have you ever heard of anything so amazing before? I haven’t! 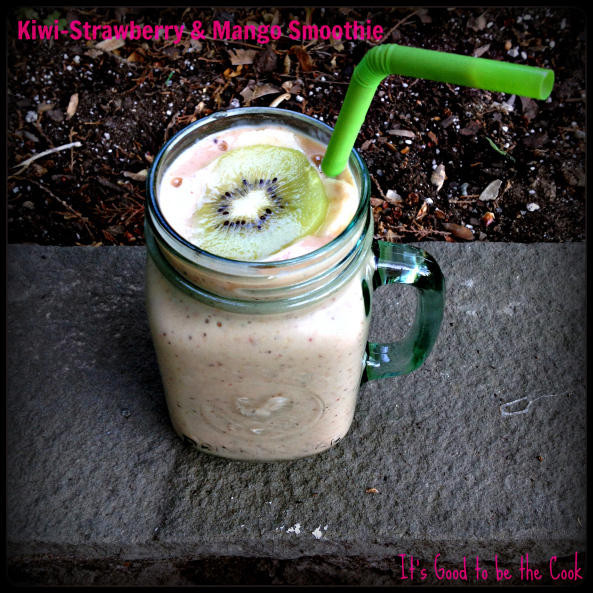 The guacamole was topped with the fruit mixture (strawberries and kiwis) which we then mixed together. 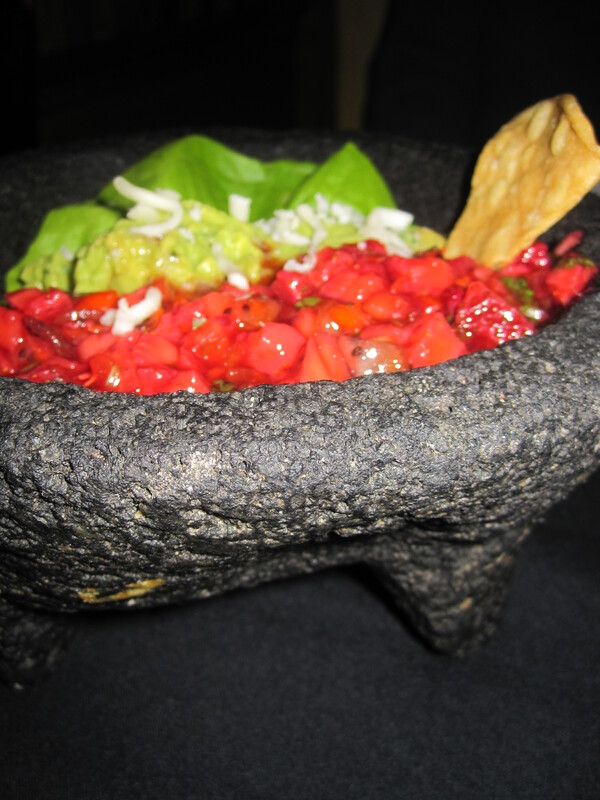 The spicy of the habenero was cooled down by the guac and also the sweetness of the strawberries. We LOVED it. 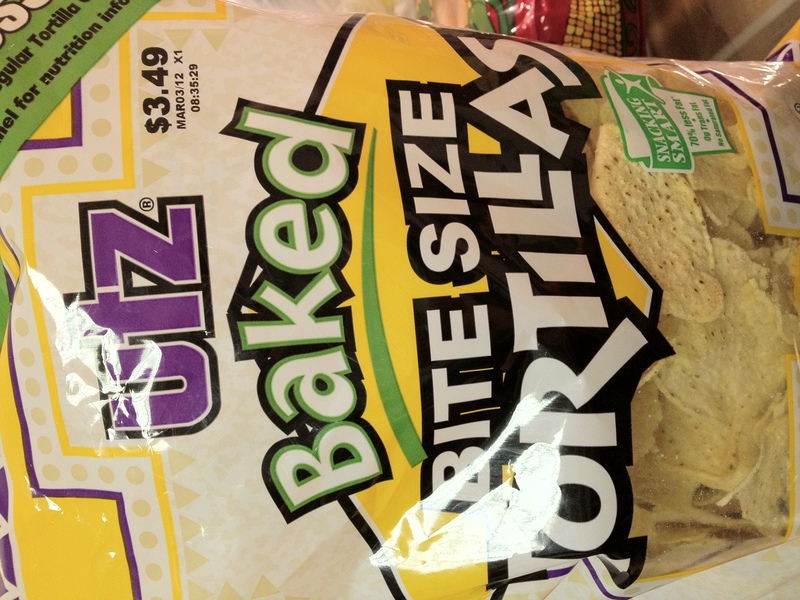 The homemade tortilla chips that came with it were just as good as the guacamole itself… if not better. No lie. We could have eaten them all night. Had to sneak a close-up in... it was just so good. 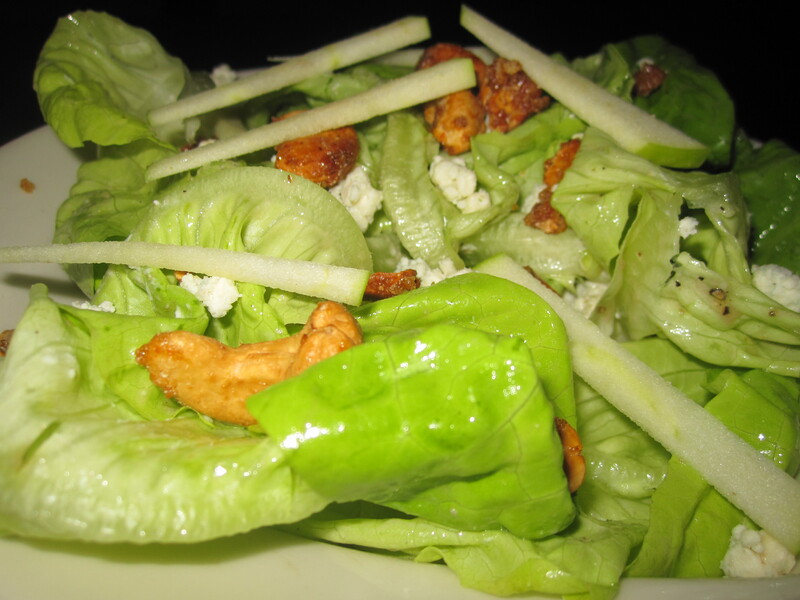 Next up was the Bibb Salad, topped with Blue Cheese, Granny Smith Apples, Spicy Cashews and Lavender Vinaigrette. This is my favorite type of salad. And by favorite type of salad… I mean it had Blue Cheese on it. And boy was it SO GOOD! It was light and everything was fresh. Genna and I both quickly agreed to order the Kobe Beef Taco with Mahon, Dates, and Pico de Gallo. WTF is Mahon? Good question… I asked the same thing! It’s a really yummy Spanish cheese. 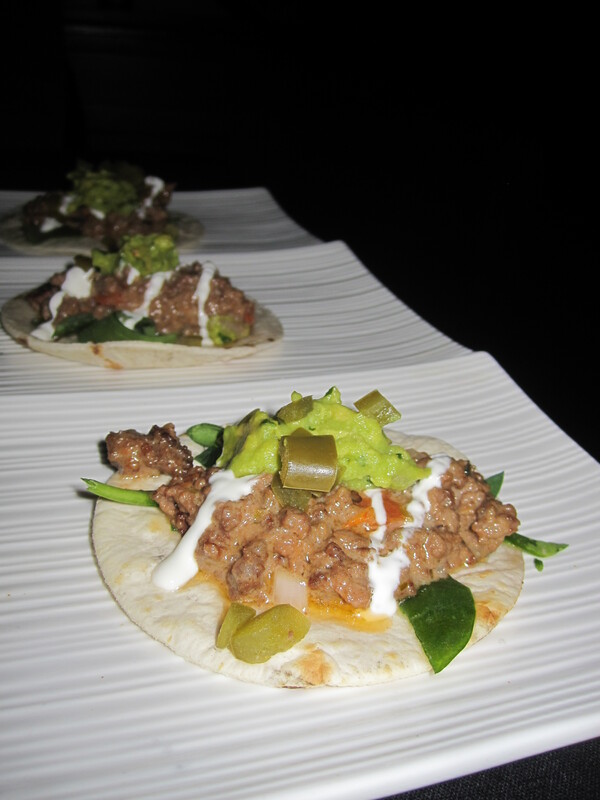 I didn’t realize the kobe beef would be ground like… a taco (imagine that?) but it still tasted delicious. I don’t know if I could notice the difference between Kobe and regular beef in this dish. I love tapas! These were just the right size to have enough to eat but try lots of different things. Similar to the Kobe Beef Taco, we ordered the Pork Carnitas. They were served taco-style also, but these were topped with Chipotle Honey BBQ, more Mahon, Jicama, Avocado, and Pomegranate. I liked the pork carnitas better than thekobe tacos. 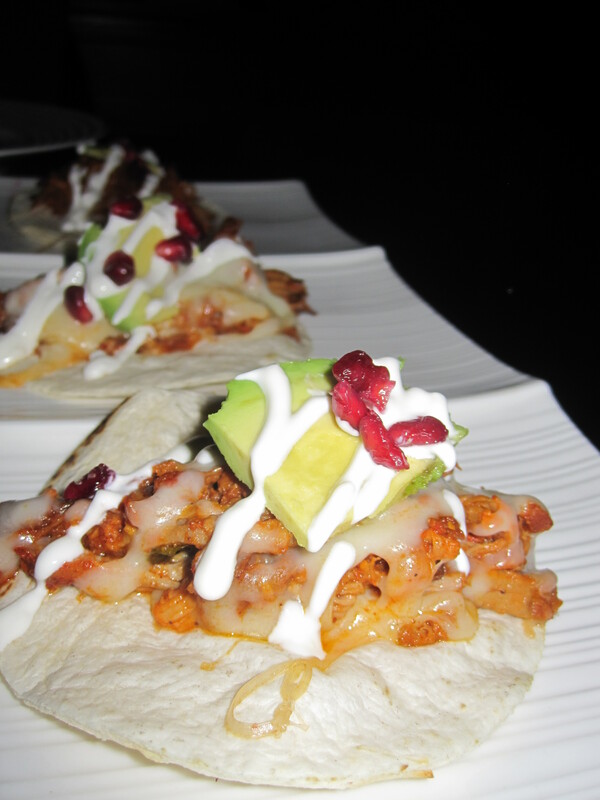 The flavor had more of a “wow” factor with the pomegranate and the pork was just so “melt in your mouth” tender. MMM! I think I'm starting to really LOVE pork! So good! Finally, we ordered one of the larger plates recommended by our server. She said it was her favorite dish at the restaurant, and I don’t blame her! 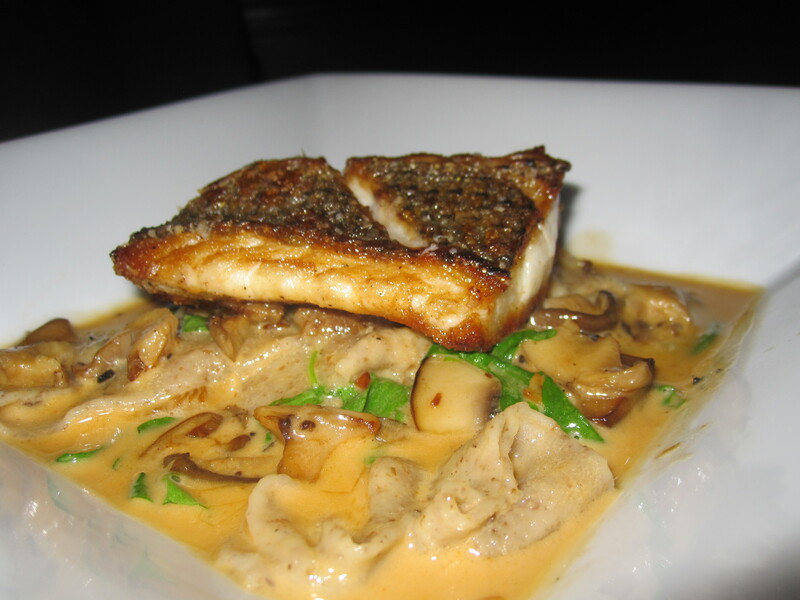 Our final dish was the Striped Bass served over homemade Papperdelle, Black Truffle, and Oyster Mushrooms. (What you should start to notice is that I always order mushroom dishes when I’m out without Dave… he hates them!) The sauce was rich from the truffle and mushrooms but the dish wasn’t too heavy with the crispy, light fish on top. The fish was so tasty and I just love restaurants that make their own pasta. It makes a huge difference. Overall, I loved Verdad. I can’t wait to go back, and would probably have to order at least the Guacamole again. What else is really cool about this restaurant is that they make authentic Paella that has to be ordered almost an hour before serving! I have to try it out, it sounds amazing! … but that will have to be for next time, when I take Genna out to dinner 🙂 Thank you Genna! After a Diet Week 1 of eating healthy Asian foods… it was time for a change. The farthest thing from Asian I could think of was MEXICAN! Mom and I cooked up a do-it-yourself Mexican feast! 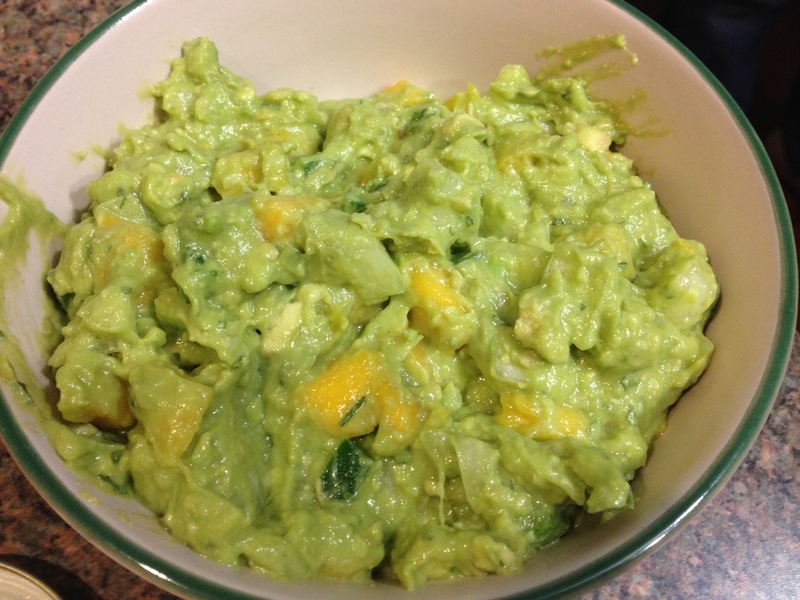 No mexican feast could be complete without some homemade guacamole. 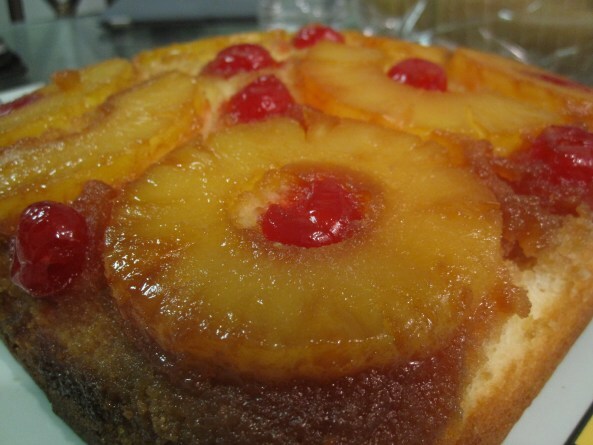 This batch happened to be the BEST one I have ever made. I couldn’t stop eating it! 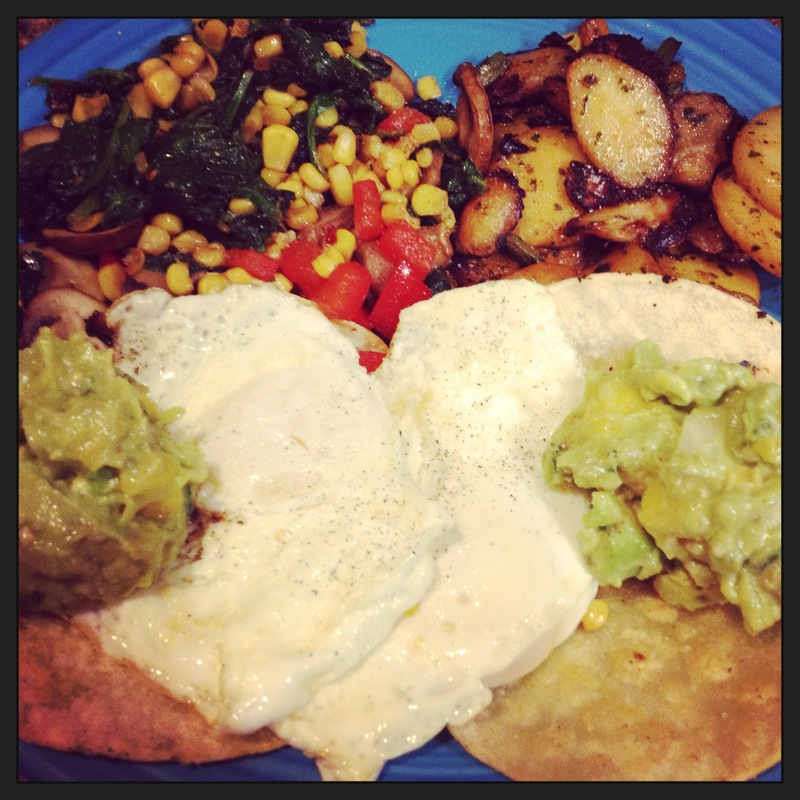 Although avocados are very healthy, you do have to watch your portion control as they are high in fat and calories. 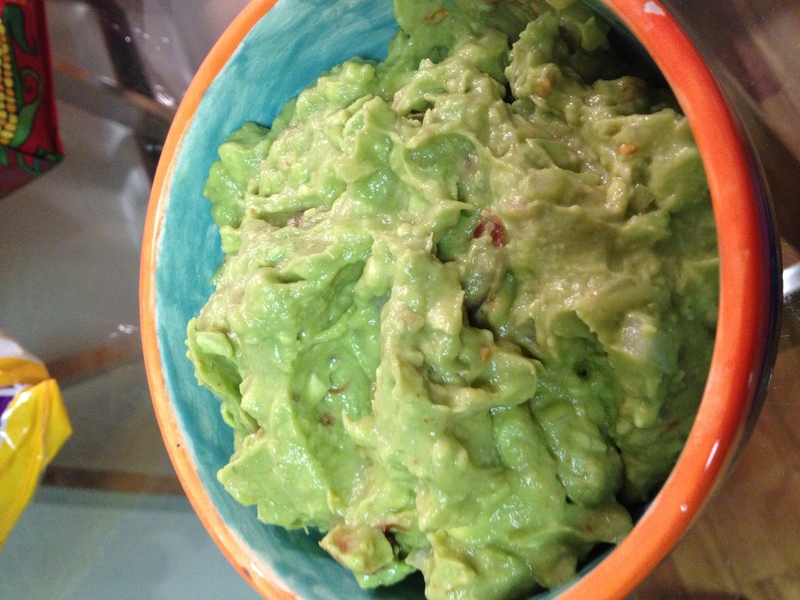 This batch of guacamole is a modification from a Paula Deen Recipe. It is so easy. All you have to do is cut the avocadoes in half and score them, making small squares still in the skin. 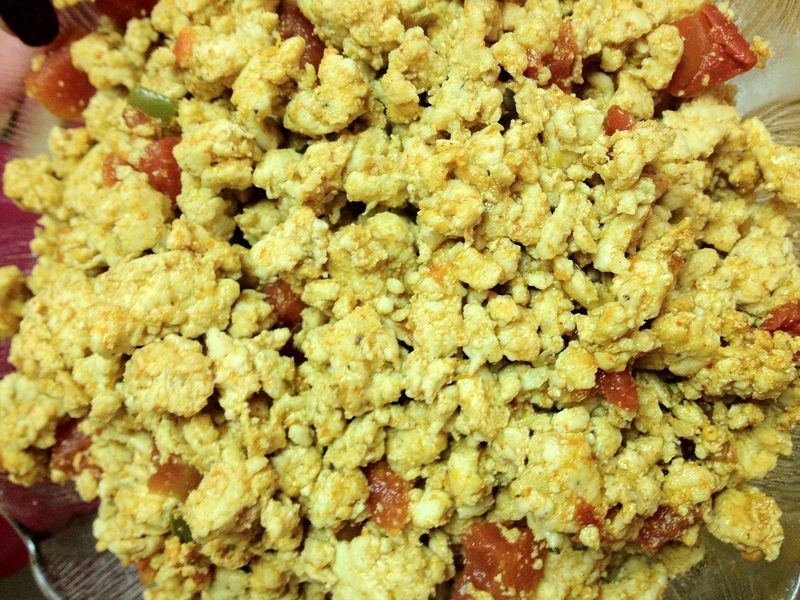 Scoop them out with a spoon and combine with the rest of the ingredients. Stir it and season to taste. That’s all! These are the healthiest, best tasting tortilla chips out there. They can be more expensive but are totally worth it. 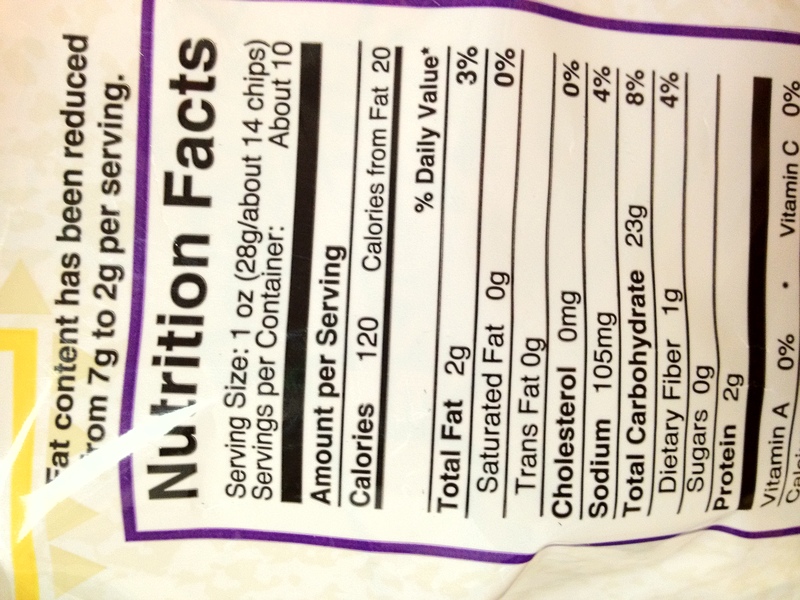 14 = 1 Serving! With the guacamole made, we had a nice snack while we cooked. Mom and I took Extra Lean Ground Turkey and cooked it in a large pan with ½ a packet of Taco Seasoning and ½ a can of Rotel (diced tomatoes with chilies). 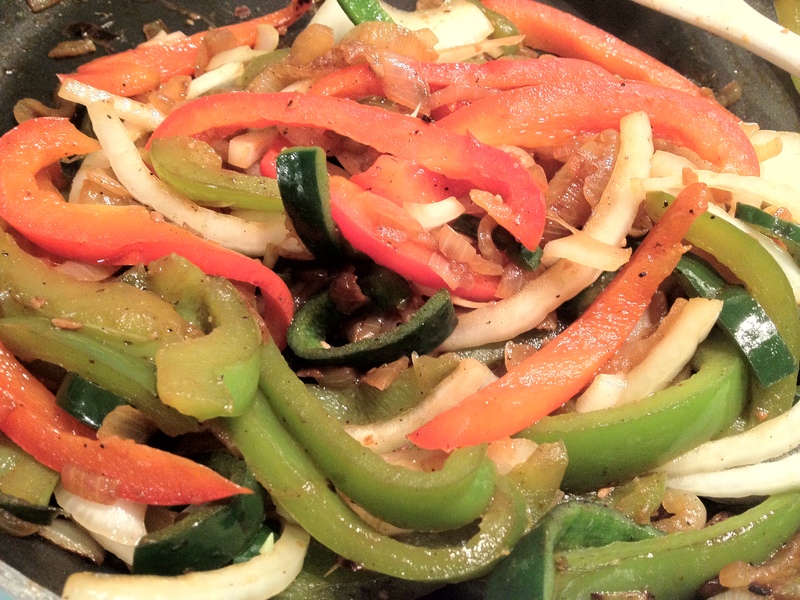 She also cooked up one green and one red Bell Pepper, one Poblano Pepper and an Onion which was sauteed on medium heat with just some Cooking Spray. I also cooked up a pot of Trader Joe’s new Corn Penne Pasta. 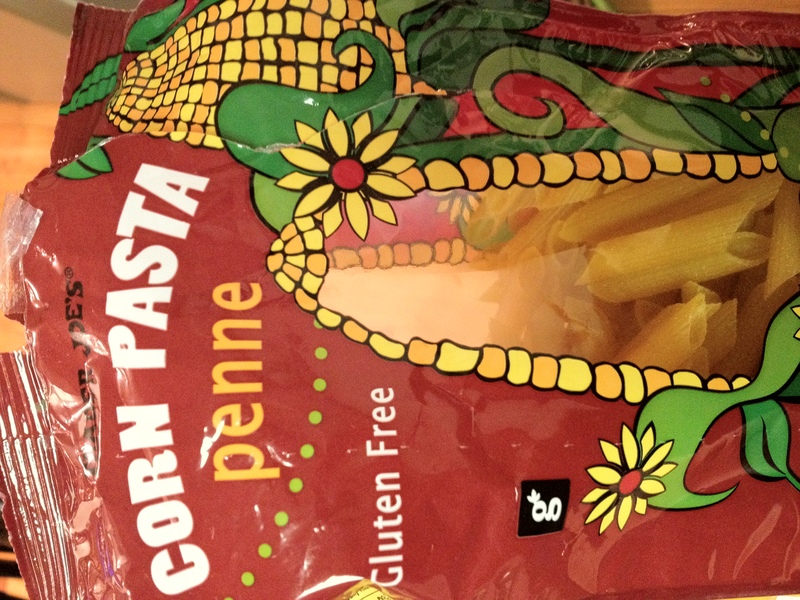 This pasta is gluten free, and my best friend Julie (who is not only GF but dairy free among other things…) highly recommended this stuff… so I had to get it! Julie did mention that you have to make sure you cook it long enough, or else it is very starchy and hard. I cooked it for about 12-15 minutes or so. 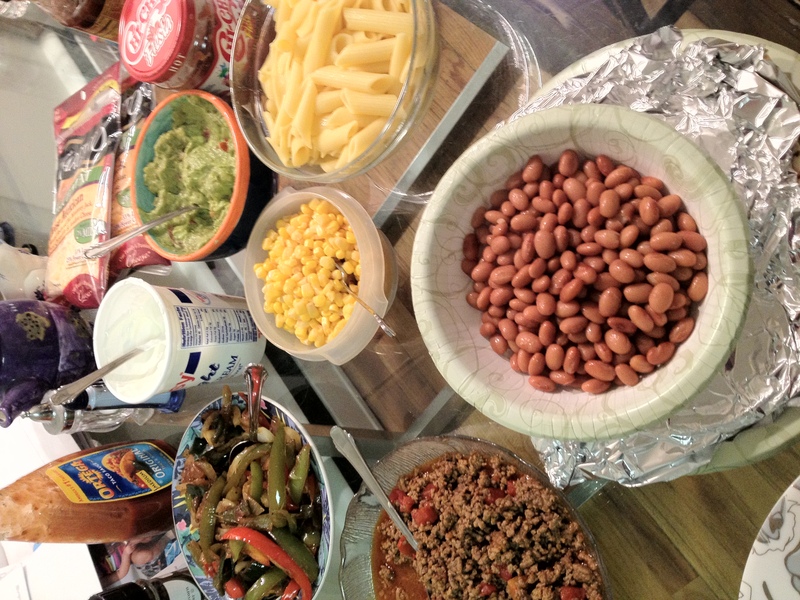 While the pasta and the ground turkey were cooking up, we prepared the rest of the ingredients: Corn, Pinto Beans, Sautéed Bell Peppers & Onions, and tortilla wraps for everyone else. My meal ended up looking amazing! 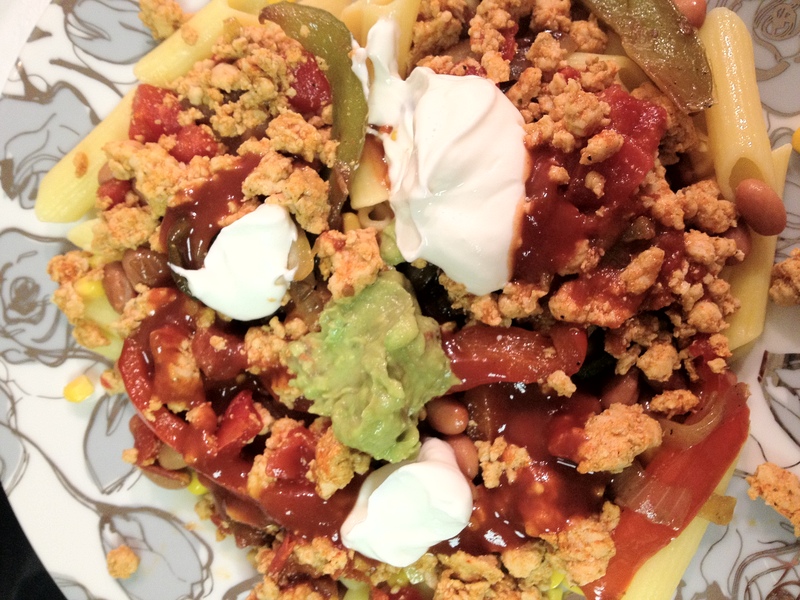 I used the corn pasta, ground turkey, beans, corn, a dollop of light sour cream & guacamole (I already ate SO much while cooking), and finished it off with some taco sauce. MMM! Delish! This was a wonderfully hearty and satisfying meal, which was a perfect follow-up to my amazing workout earlier in the evening. I had to share that I ran THREE MILES for the second time in my life! I am so proud of myself. What have you been doing to get in better shape and stick with the January 2012 Healthy Lifestyle Challenge?? ?